Login to your Author’s Area to update your Review Page with your picture and biography, as well as links to your book trailer, website, and social networking pages. You will also find other helpful information and lots of free options to get the most out of your new review. Jane Guttman’s Kids in Jail: A Portrait of Life Without Mercy is a forceful narrative about one of the most disturbing social issues facing our society today; the splintered state of our juvenile justice system. It exposes the devastating stories of thirteen children who are behind bars in a series of poignant poems that reveal their fears, shame and hopes. Allie has been in jail since childhood. Tough, bitter and smart, she screams for love and understanding as she continues her days in captivity, dreaming of rising from the ruin that is her young troubled life. Rashad has been out of jail since three days. If he finishes high school, he will be the first one in the family to do so. Dirt poor and struggling, his mother is unable to nurture and guide him. Most of these kids do not have many choices because they are either abandoned by their own parents or live in troubled foster homes and dangerous neighborhoods. Some are lured by the wrong friends and blinded by drug use. And they all end up in jail where a career in crime awaits them, unless sweeping changes are done to the juvenile justice system. Kids in Jail: A Portrait of Life Without Mercy is as eloquent as it is heartrending! Jane Guttman has taught incarcerated teens for decades. In Kids in Jail, she shares stories of some of the youths she has met over the years. Her approach is to take their thoughts and turn them into poem-type narratives. Thus, in Guttman’s own words, she has “used creative license in an effort to represent [particular students of hers] from . . . the countless youth who . . . endure these conditions.” In her words, she does this “not to speak for, but rather to give voice to, them, and to their experiences.” So, at times, Guttman shares the experience of a hopeful youth. (“See, I didn’t know when I was on the streets that I had gifts. I didn’t know. I learned about that in book club.”). Other times, she shares insights from one beyond hope. (“Not gonna be a teacher, or a dad or a doctor or firefighter, or tattoo artist. Gonna be an inmate.”) Guttman’s common theme is to illustrate the agony that many young people contend with in the facilities in which they live, and the abusive manner in which some of the “professionals” responsible for them approach their jobs. Essentially, she intends to present how necessary reform is to the current system, so that more youths do not fall victim to its cruelties and inadequacies. The presentation Jane Guttman provides in Kids in Jail is not scholarly in the sense of including information about statistics, or of what happens when/if a correctional officer is found to have crossed the line. (Indeed, I would have found such information very enlightening.) If a reader is looking to understand how frequent the events she tells of occur, this is not the resource. But whether it is one youth that is hosed down, ignored while suicidal, or bullied by other youngsters at the behest of the “correctional officers,” or if it is thousands, it is too many. For this reason, Guttman’s attempts to advocate for improvement on behalf of her students is laudable, and it is done in a manner that I found, at times, hauntingly beautiful. Kids in Jail by Jane Guttman is gut-wrenching reading. Jane’s beautifully written overview of young lives deliberately destroyed will likely bring tears to your eyes. At the very least it will evoke anger; anger that so many young lives are being further damaged at the hands of the very people paid to protect them. The narrative of each young person speaks of the inner turmoil, distrust, and hopelessness trapped in the hearts and minds of these ‘dysfunctional’ young people. Their bitterness has been born of cruelty beyond our imagination, not only from family members, but also from institutional staff taking pleasure in abusing the weakest of them. Yes, some are hardened criminals, even at their young age, but the reader is given ample time to discover the reasons behind the actions. As you read on, it becomes clear that incarceration for young folk is the wrong choice for many. Being victims of their circumstances, they strike out however they can for attention. Many just need to be loved – truly loved – not in the dirty, used sense of the word. They cry out for understanding, and someone they can rely on to lead them in the right direction. When young lives have been exposed to drug users, abusers, and mentally weak adults, they have little or no chance to know right from wrong. Reform is obviously needed, because numerous young people are at risk, even in the detention centres that should be relatively safe havens. This book is a heart-wrenching look at the innermost thoughts and yearnings of young guys and girls who desperately yearn to be loved, and listened to; not locked up. A hard book to read, yet definitely a must-read, if only to enlighten the broader public that all is not right with our laws and reforms. Many individuals just yearn for an earnest hug and the words ‘How can I help?' This book gave me a new perspective; instead of judging, I wanted to reach out and hug some of them. 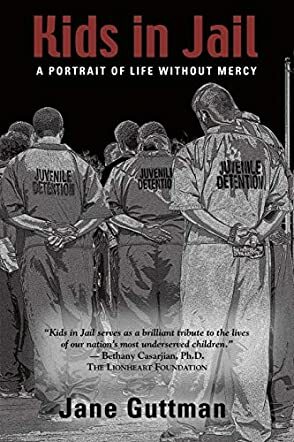 Kids in Jail: A Portrait of Life without Mercy by Jane Guttman is a hard book to review and an even harder book to read. The difficulty I had with both reading and now reviewing Kids in Jail is handling the pain, that of both the author and her subjects, children in juvenile prisons. Nothing I’ve seen on TV or the evening news prepared me for what I read and felt for Jane Guttman and the Matthews, Lolas, Ryans, Sophies and others who are the voices behind the 13 poems in Kids in Jail. These are children who are half-dead, or already dead before they have lived. They grew up in the streets where gangs rule, where drugs give and take away pain, and what they did on the streets, and where they are now, is where and how their parents lived before giving birth to them. And now, as they live out their young lives in juvy, so many of them continue to be punished. Some are denied medication, even an inhaler; other inmates are encouraged to beat them up when guards do anything but guard. Some like Lola are pregnant, wondering if she will ever get out to raise her child or will she choose suicide instead. Others think of their mothers and grandmothers and hold onto the hope that someone on the outside still loves them. Thanks to dedicated and caring teachers, like Jane Guttman, some of these Kids in Jail have actually come to believe they will make something of themselves once they get out of incarceration. Jane has restored a touch of their self esteem, not a lot, but perhaps enough to convince them that, if they do get out, they will do their best to never be incarcerated again. Others have given up all hope of ever leaving and have resigned themselves to life without parole. Toward the end of this gut-wrenching book, Jane Guttman holds an “in memoriam” for 16 named children who died in custody or related to custody. How can she erase the memory of those students? Teaching is a hard enough job in regular schools, but it takes a very strong and special person to teach such troubled, unhappy children inside a prison. Jane Guttman and some of her associates deserve a medal. But Jane isn’t looking for a medal: she’s looking for reforms to sentencing children to lives without parole, because even those who do get out eventually will always be on parole. She’s looking for reforms to what goes on inside juvenile prisons. She’s looking for ways to educate and enlighten everyone on both sides of the barbed wire. Her book, Kids in Jail, is only the beginning of a very long journey to find a way for “bad” kids to show the good buried deep inside so many of them. Readers who listen to those children's voices, made audible through Jane Guttman’s poems, will see them in a completely different light and won’t soon forget them. Kids in Jail by Jane Guttman is a very important book. If you truly care about children, read it.